The Kodak Digitizing Box brings a modern version of Kodak’s yellow envelope back to customer door steps. A box is shipped to the customer and they place inside of it the media they want to be converted. The media is mailed back in a pre-paid, pre-addressed box. The Kodak Digitizing Box offers four options of service, with 19 types of media available for conversion to digital, including, VHS tapes, Reel to Reel audio tape, Super 8 Film, 35mm slides and picture negatives. ROCHESTER, N.Y.--(BUSINESS WIRE)--Kodak is pleased to announce the introduction of the KODAK Digitizing Box, a service designed to help transfer old memories into present day viewing options. The offering is part of a new brand licensing agreement with AMB Media LLC, a direct to consumer digitizer of home movies and photos. The KODAK Digitizing Box brings a modern version of Kodak’s yellow envelope back to customer door steps and aims to make the daunting task of digitizing aging media easy. A box is shipped to the customer and they place inside of it the media they want to be converted. The media is mailed back in a pre-paid, pre-addressed box. Throughout the entire process, a barcode system has been put in place to track the progress of the box every step of the way. In a matter of weeks, the customer is sent plug and play media, DVDs or digital downloads, along with the treasured memories they sent to be converted. 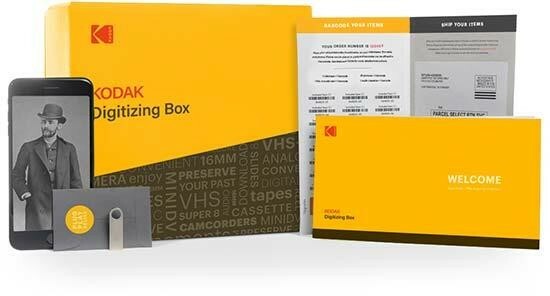 The KODAK Digitizing Box offers four options of service, with 19 types of media available for conversion to digital, including, VHS tapes, Reel to Reel audio tape, Super 8 Film, 35mm slides and picture negatives just to name a few. Customers can order their KODAK Digitizing Box by going to kodakdigitizing.com. Boxes will also be available at select Bloomingdale’s stores beginning in November 2018.